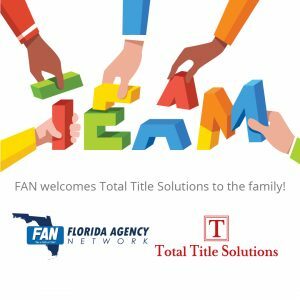 Florida Agency Network (FAN) expands into key Florida markets! Today, April 15, marks the first day of a new merger between Total Title Solutions (TTS) and FAN. FAN will take control of TTS’ operations. Angie Haddon will become a Division Manager for FAN, while Lisa Jahr will be promoted to Regional Manager and will oversee offices throughout the Tampa Bay Area. The merger will bring 27 new team members to the FANily and grow FAN’s geographical footprint by 5 additional offices, which include two in Pinellas, two in Pasco, and one in Hernando County. “We are so excited to have TTS become part of FAN and continue to grow our footprint in the Tampa Bay Area. Abe, Angie, and the team have a like-minded culture to FAN, and we are grateful for the opportunity to service our clients together,” stated Amy Gregory, President of Title Operations for FAN. It’s deja vu all over again for struggling Florida homeowners: The massive tax break that saved them tens of thousands of dollars has once again expired. Underwater homeowners whose lenders let them sell their home for less than they owed have not had to pay taxes on that debt thanks to a law passed shortly after the housing bubble burst. The Mortgage Forgiveness Debt Relief Act has been extended twice since 2007, including last year. But its expiration Dec. 31 could mean a rude awakening for homeowners come tax time. Florida houses more than 1 million of the 6 million underwater mortgages nationwide. Even with rising home prices, about 30 percent of Tampa Bay’s 600,000 outstanding loans remain underwater. Those homeowners, many of whom bought at inflated prices during the housing boom, could ask the bank for a short sale that would let them move and dodge their debt. But even if the bank forgave the debt, they would still be responsible for paying taxes on what is effectively an increase in their income. A short sale of $100,000 less than the homeowner’s mortgage debt could, in a 25 percent tax bracket, mean a $25,000 surprise in taxes. And it’s not just short sellers. Foreclosed homeowners would owe taxes on what they failed to pay on their mortgage. Even homeowners offered mortgage help, like loan modifications or principal forgiveness, would be on the hook for taxes on what was cut. Lawmakers could discuss an extension this month alongside dozens of other expired tax breaks. Pending bills now in Congress would extend the tax break through 2015. Realtors short-sold 6,700 Tampa Bay homes, townhomes and condos last year, listing data show, and more than 1,500 are now listed for short sale. Up to $2 million of a homeowner’s forgiven debt qualifies for the tax break. The extension last year saved taxpayers across the country $1.3 billion, federal data show. Housing advocates said the expired tax break will hurt those least able to afford more in taxes. Agents for some distressed homeowners attempted to rush through short sales last year to dodge the “phantom income” tax bill. Many distressed homeowners can dodge the mortgage debt taxes if they prove to the IRS they are insolvent, owing more in debts than what they own in assets. That can be a saving grace for short sellers today who are in deep financial trouble. “This relief is crucial to both the homeowners struggling to regain their financial footing and to the battered housing market whose recovery is slow and still uncertain,” they wrote. We had a roarin’ good time at the juice joint! Thank’s TBBA for putting on such a fun event. A big CONGRATS to HT’s very own Cathy Trongeau for being awarded Title Insurance Closer/Salesperson Of The Year.